February Cheap Eats… Delicious recipes for under £2 per portion! I don’t know about you, but this cold, miserable weather is starting to bring me down! I’m spending way too much time day-dreaming about sunshine and the sea; along with sitting out in the garden on a warm evening enjoying smoky barbecue food and sipping a cold gin and tonic, Winter can officially do one!!!! With the wish for warmer times comes the planning of a holiday, and in our case, also getting the patio done, which makes for February to be all about saving! With this in mind I thought I should share with you some delicious cheap-eats, all for under £2 per portion and packed full of healthy vegetables and punchy flavours. There is a recipe here for everyone – the meat lover will devour the Singapore Pork, the comfort loving, fish-fan will wolf down the salmon pasta bake and the baked spinach and eggs won’t just make the vegetarians smile! From now on all the homemade recipes I share with you will not only contain a nutritional breakdown, but also a cost per meal… so you know exactly what you’re getting on your fork! Heat your butter in a saucepan and gently fry the leeks and the courgettes until soft. Stir in the milk and once steaming add your flour paste and continue to stir until the sauce has thickened. Once thickened, add your parmesan cheese and stir until it has melted. Season the sauce and then mix together with your pasta, peas and salmon. 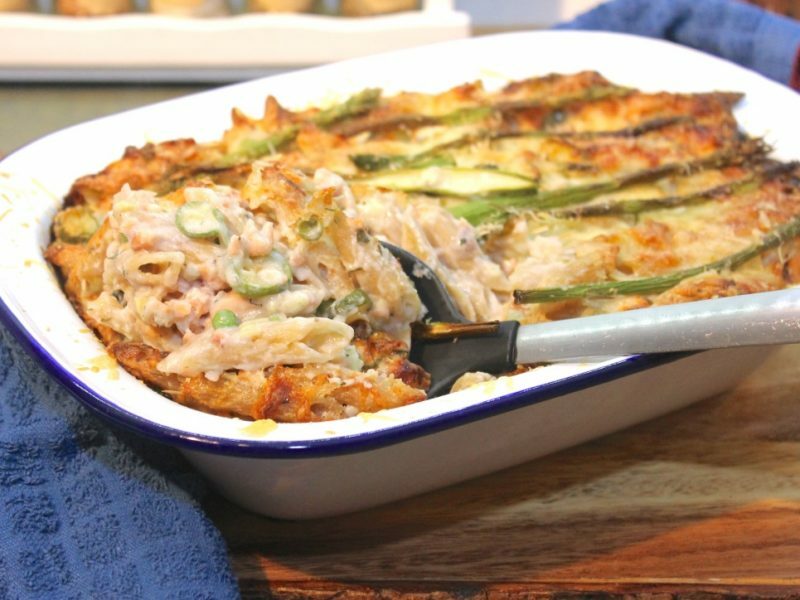 Transfer your pasta to an ovendish and top with the asparagus tips and the cheeses. Bake in the oven for 30-40 minutes until lovely and crisp. Preheat a pan with boiling salty water and cook your potatoes for 10 minutes. Strain and return to the pan to shake off any excess moisture. Toss the potatoes in the oil and tip into a large ovenproof dish. Bake for 40 minutes, stirring halfway through. In the meantime, heat a splash of oil in a large frying pan and gently fry the onion until soft. Add the garlic to the pan for a few minutes before stirring in the mushrooms and peas and frying until all the moisture has evaporated from the pan. Stir in your spinach and kale and once wilted add the oregano, mustard and cream and give the pan a good stir so it’s well combined. Season to taste and then tip this into the oven dish with the potatoes. Make sure the mixture is evenly mixed and make a shallow hole on each side to crack your eggs into. Add your eggs and then return to the oven to bake for 8-10 minutes. Once your eggs are cooked to your liking, remove and dust with the paprika. Serve with a big dollop of mayonnaise or ketchup (or whatever takes your fancy), and enjoy! Smother the pork steaks in the sweet chili sauce and leave to marinate while you prep your other ingredients. Heat a wok to a medium temperature and add the oil. Once hot add the vegetables and cook for 5 minutes. Add your noodles to the vegetables and heat through for about 3 minutes. 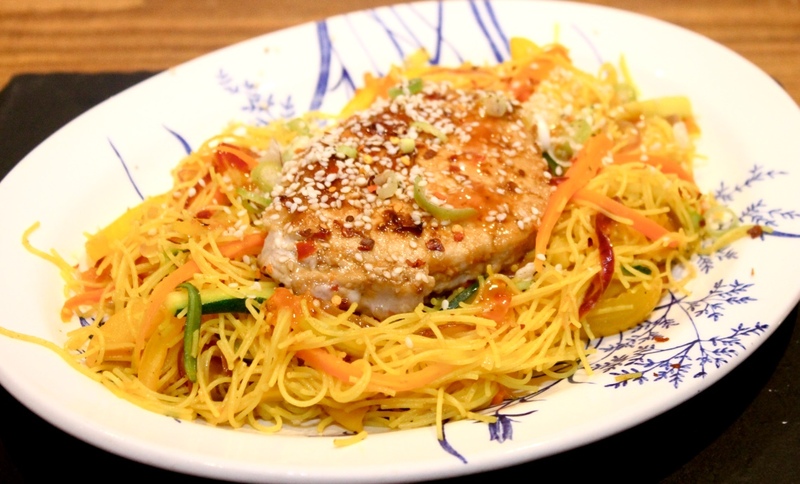 Scatter of your sesame seeds, a twist of salt and pepper and your spring onion. Squeeze over your lime juice and enjoy. Thank you for sharing these yummy but affordable recipes – they sound perfect for this time of year. Some great ideas! We’re really loving baked eggs with Brussels sprouts and bacon right now. 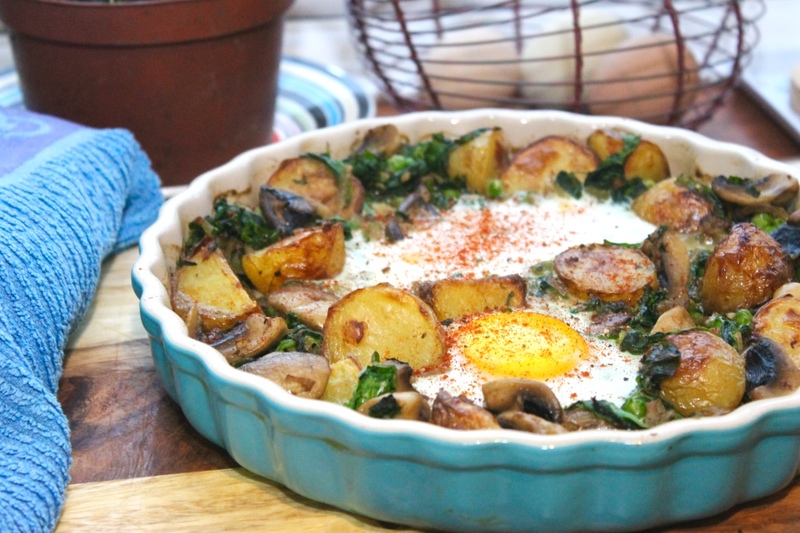 Your version with spinach, mushrooms and potatoes looks delicious. Definitely one to add to the recipe book. Thanks for sharing. Thank you, baked eggs are such a winner for me at the moment! – So easy and so delicious, sounds like a g great combo with sprouts and bacon.